Have you heard of growing food without soil? Have you heard about kids/youth caring for a garden right in their own classroom, community centre or community house? Finance: Growing Futures, is a project that is engaging our children and the youth of our community. When you partner them up with local businesses, and you have a new gene ration of healthy, entrepreneurial children that are excited to share their experiences with family and friends. The Food and Finance: Growing Futures Project was born from an idea that the Director of PFC, Karen Secord had one day. She realized that when it comes to middle class habits around food, there was a gap between what people think they should be doing versus what people are actually doing. Every parent wants to feed their children healthy wholesome foods, but for many reasons it doesn’t always happen. She realized that if we bring in the children and get them excited about eating healthy at an early age, then change becomes easier. 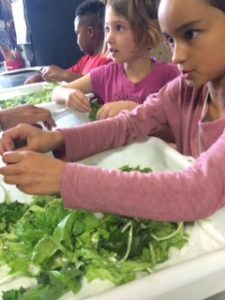 Not only eating healthier, but teaching kids real life skills to make a healthier, happier, and more employment ready generation. So how are we doing this? Bring in the Tower Gardens! 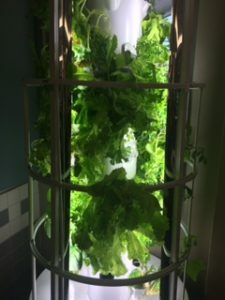 Tower Gardens are state-of- the-art vertical aeroponic growing systems that can be set up indoors with a very small footprint. The Tower can grow vegetables, herbs, flowers and many different kinds of fruit in less time than it takes in soil. From seeds, to seedlings, to planting, to harvesting, kids are taking ownership and pride in growing their own food. 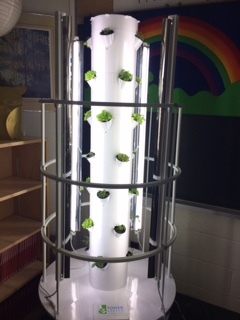 As a Holistic Nutritionist and Project Manager of this venture, I have experienced firsthand how many children, using the Tower Garden in various schools, community houses, or community centre, have embraced this project with open arms and now open mouths as they harvest their gardens! The Tower Gardens are located in 3 schools, 2 community houses, a community centre and a food bank where teachers and youth workers have embraced this project. Children as young as 4 years old to the age of 14 are growing, cooking, marketing and selling. I have witnessed an increase in appetite and the desire not only to eat healthy, but to share with others. Local business owners are also on board! Sheila Whyte, Owner of Thyme & Again, Wentzi Yeung, Owner of Culture Kombucha, and Jo Ann Laverty, Owner of Cake Lab have partnered with Fisher Summit, Connaught PS, and Devonshire PS respectively. Business owners and students together are working together to share knowledge and cultivate curiosity. Students understand that this partnership with the Food and Finance Project is a rare learning opportunity, and are proud to be part of the success of this program will no doubt have for them as individuals, and for the community. These opportunities are life changers! One student’s experience struck me as unique. This student had struggled for an entire 50 minute period to understand place value (how ones, tens, hundreds, work). She was stumped and my heart ached for her. So, during our next period when I introduced the Garden Log’s and saw her face light up, mostly because she was eager to explore the garden, but also because she understood this meant a short reprieve from the dreaded study of place value; Or so she thought! So we then looked back at her paper and the lonely 5 recorded there, and I asked, “so, what does a 39 and a half look like?” She looked at the linking cubes and at the 5 on her page and quickly wrote, 5.5cm. When she made this realization her smile reflected a sense of contentedness, of accomplishment, and a warmth slowly lit her eyes. She went back to the garden and kept recording plant heights. Math hurdle cleared with a little help from the dill growing in our garden. Awesome! Salad Bowl Day Lunch at Devonshire PS with teacher Stephen Skoutajan and his grade five students. 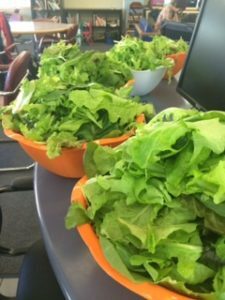 Students filled their plates with gourmet lettuce just harvested from their tower. A lesson in dicing and cutting other veggies brought in from outdoor gardens, added an extra punch of nutrition and taste. Connaught PS, grade 4/5 class, teacher Michelle Richardson – prepping their harvest on a field trip to the Parkdale Food Centre, to be creatively displayed as a Mason Jar Salad with Chef Simon Bell to surprise family at the evening meal. Dovercourt Community Centre with their after school youth program, harvested 2,700 grams of fresh gourmet lettuce! 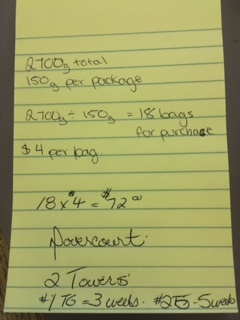 The youth went on to prepare 18 bags of lettuce, 150 grams per bag, sold for $4.00 per bag. The $72.00 earned will go back into their program for field trips and other educational tools. 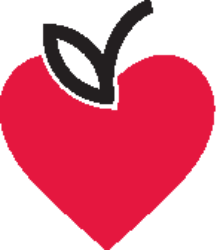 Futures, is a program that will not only provide wholesome food to our youth, but it will spark desire to eat healthier in life and to understand the importance of food. The children and youth will learn and see the connection between healthy bodies and healthy minds, energy and happiness. They will appreciate healthy food and the connections it is bringing to them in their communities. Confidence around financial literacy will instil the power in our younger generation to follow their dreams and become the entrepreneurs of the future.